In August 2015, public health laboratory scientists at the Virginia Division of Consolidated Laboratory Services (DCLS) notified foodborne disease epidemiologists at the Virginia Department of Health (VDH) that they were sending data on four Salmonella Enteritidis isolates from a single rural county in central Virginia. They all had matching PFGE patterns. During case review, the epidemiologists identified four additional cases of salmonellosis from the same central Virginia county, but without matching PFGE patterns. All of the isolates were Salmonella Enteritidis, and the timing of the cases was also significant with all eight patients becoming ill within a few weeks of each other. Despite these commonalities, the eight Salmonella Enteritidis isolates encompassed three different PFGE patterns, which generally wouldn’t link them as a cluster. Were these simply sporadic individual cases or was it an emerging outbreak? Given the similar (albeit slightly different) PFGE patterns, similar location of the patients and relatively short time period of illness onset, there was enough to prompt further investigation. As a PulseNet participating laboratory, DCLS also submitted the PFGE patterns and corresponding data to the PulseNet national database. PulseNet data in conjunction with epidemiological data can be used to quickly connect similar cases of foodborne illness to link them back to a common source. 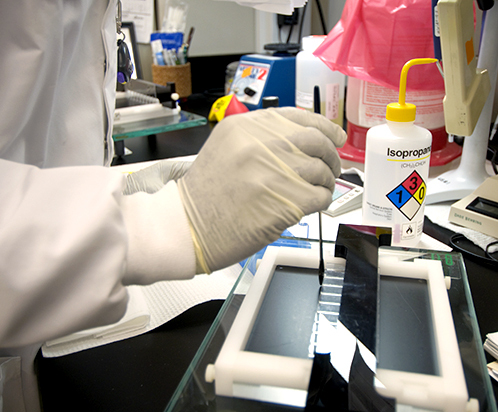 Within Virginia’s public health system, there is constant two-way communication between the public health laboratory scientists and the foodborne disease epidemiologists. In any investigation, even after turning over cluster information, the public health lab wants to hear what the epis are finding in their investigation; and the epis might want to know if additional testing or analysis is available to support their investigation. In this case, the epis told the public health lab scientists about their findings: despite the Salmonella Enteritidis isolates from the patients having three different PFGE patterns, six out of eight patients reported visiting the same restaurant within the same time period before becoming ill. It was beginning to sound like this was an outbreak with a common source, but more testing was needed to confirm. The public health lab staff and epidemiologists agreed this information supported further testing using whole genome sequencing (WGS) to better understand the relationship between isolates. 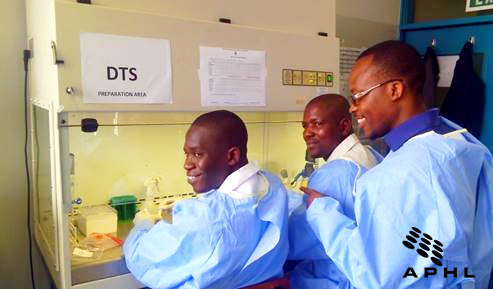 WGS offers a fast, inexpensive way to improve PulseNet’s surveillance, and it allows participating laboratories like DCLS to use resources more efficiently. In Virginia, this was the first application of WGS to a local outbreak investigation. WGS analysis showed that seven of the eight Salmonella Enteritidis isolates were highly genetically related. The WGS data provided support for the epidemiologists’ hypothesis that there was a common-source outbreak, most likely associated with a single restaurant. Upon inspection, it was revealed that the restaurant had two serious issues related to temperature monitoring and control that were later corrected. No specific food was implicated during this investigation, but temperature abuse could have been a factor in allowing the proliferation of Salmonella in the facility. While PFGE data helped identify the cluster and prompted an investigation, WGS information strengthened the correlation between the isolates and supported the epidemiologists’ investigation results to complete the story. 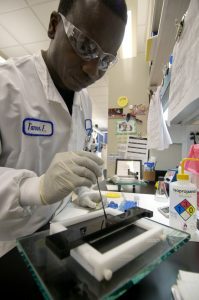 Frequent communication and collaboration between the epis and public health lab scientists proved critical to both the identification and resolution of the outbreak. Due to the success with this outbreak, the use of WGS for other investigations is ongoing in Virginia. WGS has been successfully used for several other outbreaks and continues to deliver that knockout punch for outbreak detection. Interested in learning more about food safety or reporting foodborne illness in Virginia? Check out the Virginia Department of Health’s My Meal Detective site for food safety videos, restaurant inspection information and more!